Feeling like a hearty bowl of soup on a cool night? This is perfect! 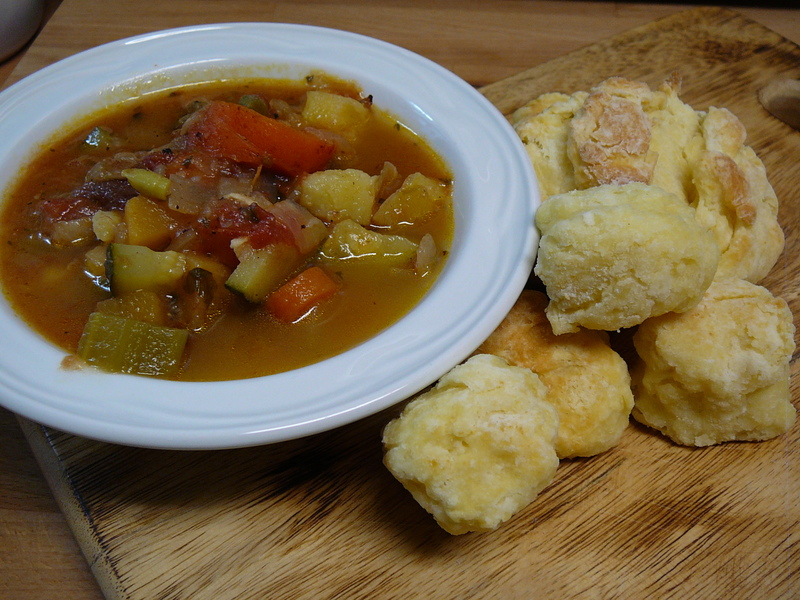 Serve with Baking Powder Biscuits for a complete meal. Any other vegetables are always optional, and always welcomed to a pot of soup! Heat a large soup pot, then add just enough olive oil to cover the bottom. Add diced onions and allow to cook long enough to soften and become translucent. Add potatoes, carrots and celery. Stir and allow to cook for about 10 minutes, stirring occasionally. Add tomatoes and vegetable stock – season to taste with salt and pepper. 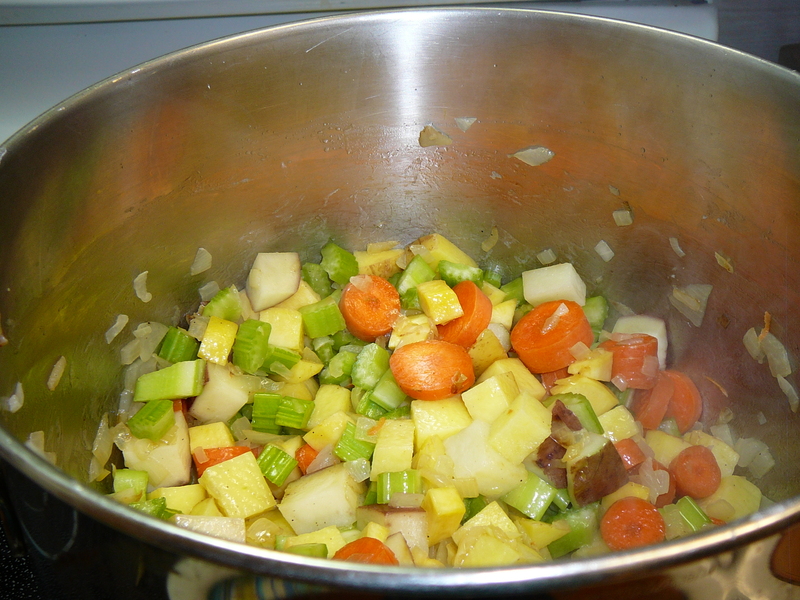 Allow to simmer until vegetables are just barely fork tender. Stir in green beans and zucchini and cook just until they are cooked through. Add fresh basil and any other herbs you feel like adding! Options: Use more vegetable stock and add barley when the potato mixture goes in or cook some pasta separately and serve the soup over the cooked pasta. (I like to cook the pasta separately so it doesn’t get too mushy.) If you want a chicken soup, use chicken stock instead of the vegetable stock and add some chopped up chicken with the stock. Combine spices in blender and process until a fine powder – set aside. In the same fry pan, saute onions until tender. Add the rest of the vegetables and saute until just starting to carmelize. Add the spice mixture, stir well until all the vegetables are coated and cook for a few minutes. Add the red wine and cook until it has reduced about 1/3. Add tomatoes, and salt to taste. Pour sauce over meat. In a slow cooker this will take about 8 hours, but if you are using a braising method it will take 3-4 hours (keep tasting for flavour and tenderness). The meat should be fork tender. The sauce is quite thick so if you are using a braising method, you may need to add a bit more cooking liquid as it cooks, eg a good beef stock. When cooked, and your beef is falling apart tender, shred with 2 forks and stir in with the sauce. I love to serve with hand made pasta – in which case I remove the sauce from the cooking pot and add to a sauce pan. As soon as my pasta is cooked I turn it into the pan to allow it to be fully seasoned by the yummy flavours. 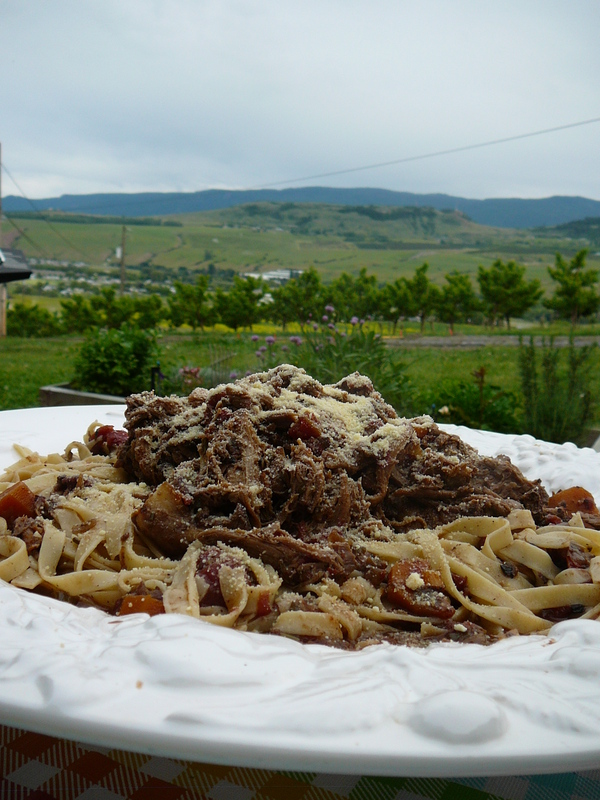 Turn into serving platter and pile your shredded beef on top. Not only will your house smell fantastic while this is cooking you will be rewarded with a fantastic dinner.